Neighborhood, Community Swap Tips and Directions Fundraiser. How to have the Best Swap Ever! The BEST EVER GUIDE to Swap Offs Big or Small! How to Have the Best Swap Ever and Be a Planetpal, too! We are a trashy bunch! Every day at home and work, each of us creates 4.5 pounds of waste (up 2 pounds since 1960). Today’s 70-year-old has generated 50 tons of trash in his lifetime. There’s some good news: A third of that waste is now recycled, compared with just 6 percent in 1960. The rest still goes to landfills or incinerators. What if we could stop that waste from going to the landfill? Town swaps often called "swap shops" at town transfer stations have been very successful at diverting up to 60% of household waste from landfills. We think that is great! Having a swap can accomplish that, too. 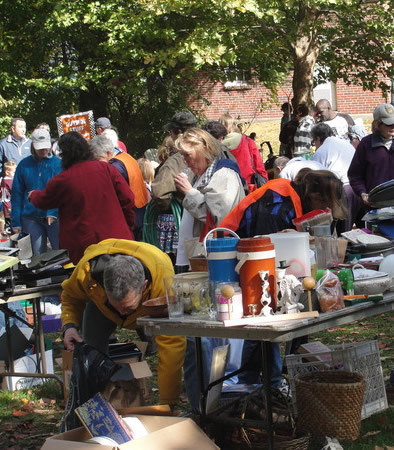 What if your town or your community does not have a local swap shop? 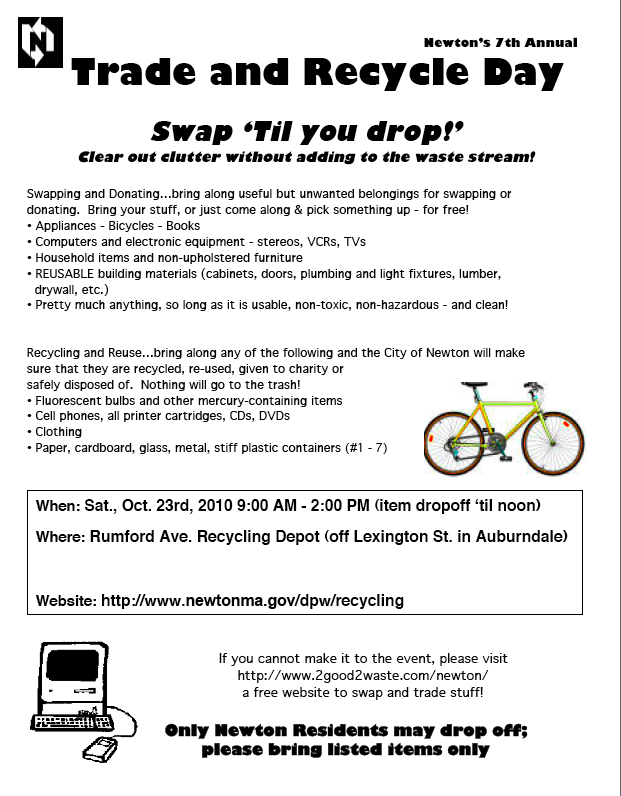 Some towns have annual or regular swaps offs, but if yours does not you can ask the recycle committee to organize one. 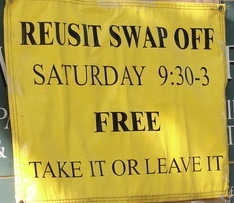 Instead of a Yard Sale you can do a swap. 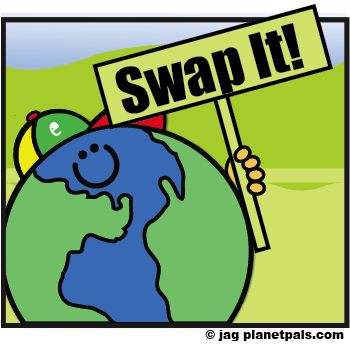 Big or small swaps accomplish the same thing...saving the landfill. So many times, you are burdened by things that you never used or barely used, things you have replaced or just don't need. You wish you could give them a new life and a new home. Try a swap or swap party! You can go as big as your neighborhood or as small as an intimate group of friends. Exchanging toys or clothing with a group of friends is a great way to do it on a small scale. We once had an artist swap at our annual holiday party, we exchanged unused art materials and craft supplies. So, see, swaps can come in all shapes and sizes. 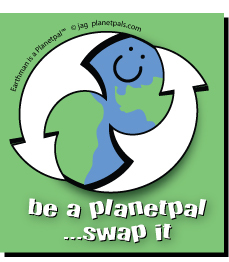 How to have a swap: Planetpals checklist, tips and do's and don'ts. Schedule a trash pick up: At the end of the day there may be items left over (but rarely). You will need someone to take it away. 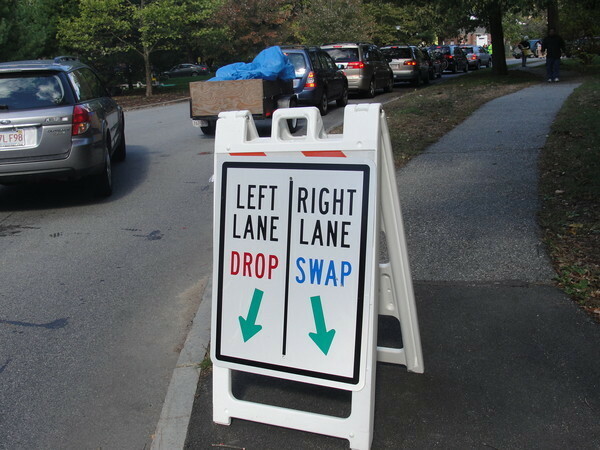 Designate areas: This is needed for a community swap for pick up and drop off. Organize stuff: In a big swap it sometimes makes sense to have designated areas for certain kinds of items. But it's not always necessary. Some swaps just put it all out in one big spot. Invites or Flyers: Flyers or invitations are not always needed-depends on the swap. But here is a sample flyer. There now-That was easy. 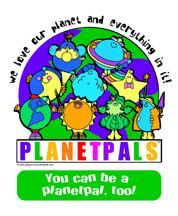 Remember: You can be a Planetpal, too! A YARD SALE and Bazaar "how to" and list of tips. How to have The Best Yard Sale Ever! Directions and Tips.